Tequila is located in the valley of a dormant volcano 56 kilometers northwest of Guadalajara in the state of Jalisco. 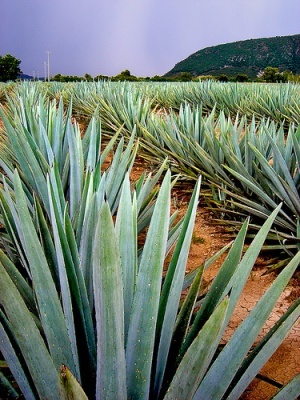 The small town of Tequila is surrounded by thousands of acres of carefully-cultivated blue agave fields. The blue agave is distilled to produce the world-famous alcoholic beverage of Tequila. Officially, only the blue agave can be used to make tequila. The village of Tequila (officially Santiago de Tequila) was founded in 1530. It is now a UNESCO world heritage site and the Mexican government has added the town to it's list of Pueblo Magico program. These "magical villages must retain natural beauty, cultural riches, or historical relevance endemic to Mexico. 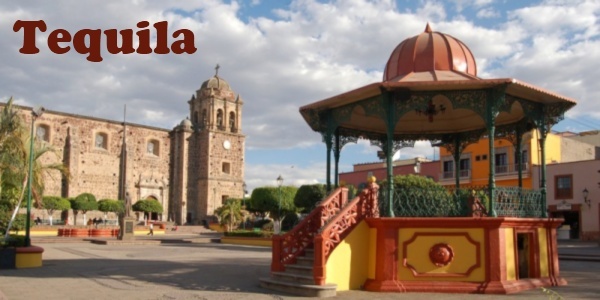 The town of Tequila contains a plesant square (or Zocalo) in it's center, large and small distilleries, museums (including the National Tequila Museum), small hotels and restaurants. With the popularity of the drink Tequila, this small village of 26,000 now receives both individual tourists and escorted group tours throughout the year. Visitors can enjoy distillery tours of some of Mexico's largest producers (Cuervo, Herradura) or smaller boutique tequila such as Tequila Fortaleza. Also of interest is the Tequila Express, a tourist train running through the Jalisco countryside to the town of Tequila. Museo Nacional del Tequila - This nuseum offers a comprehensive exhibition on the history and production process of the famous drink, plus an outstanding collection of tequila bottles. La Rojena - This part of Mundo Cuervo, Tequila's largest producer of tequila. On this distillery tour (and other brand's tours) you can discover the tequila manufacturing process; from traditional cooking ovens to the cellars where the wooden barrels of tequila are aged to a the tasting room. Festival Cultural del Tequila is held in March. It's a three-day fiesta with concerts, galas, and,of course, tequila! Feria Nacional del Tequila is usually held the last weekend in November through December 12th each year. Festivities include cultural activities, handicrafts, music, and tequila tasting. During the two week festival, Our Lady of the Immaculate Conception is celebrated Dec. 8th and the Virgin of Guadalupe is celebrated on Dec. 12th.